And by the way, this doesn’t really bother me just pointing it out the pc version is slightly better in graphics, FPS, and shows a monitor being pulled up, but I still really like playing this on mobile at a sleepover at night with headphones. Real good job. Look Scott, the fnaf franchise is amazing, heck, I wish I had all the games. But there is one you are forgetting, FNAF PIZZERIA SIMULATOR! A good explanation about why pizzeria simulator isn’t on mobile devices. I mean, come on, think about the ones with phones or tablets, and pizzeria simulator is a really good game. So if you could at least explain why PS (pizzeria simulator) can not go on to mobile devices or at least add it to the App Store, that would be great! 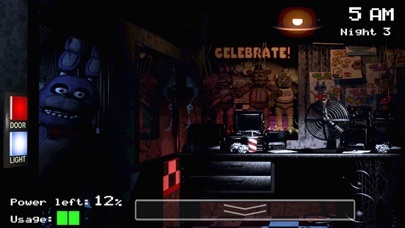 But I’m not saying I hate the franchise, NO, in fact, I LOOOOOOOVVVVVVVVEEEEEEE it, but please at least add PS and UCN (ultimate custom night) to mobile devices, that would make you more successful. “And if you accidentally trigger those spring locks, two things will happen: first, all the locks will snap right into you, making deep cuts all over your body, and a split second later all the animatronic parts they’ve been holding back, all the shark steel and hard plastic, will instantly be driven into your body. You will die, but it will be slow. You’ll feel your organs punctured, the suit will grow wet with your blood, and you will know your dying for long, long, minutes. You’ll try to scream, but you will be unable to. Your vocal cords will be severed, and your lungs will fill with your own blood until you drown in it.” - from The Silver Eyes! Night five is hard... 😒 but the game is awesome!